Here's a graphic photo of Rev.Fr. 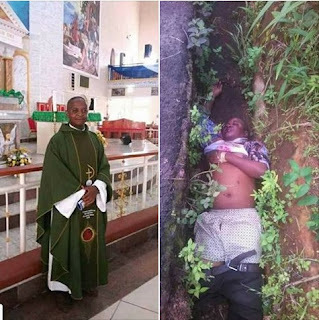 Cyriacus Onunkwo., a Catholic priest in Imo state, who was murdered by unknown gunmen. Onunkwo was said to have been abducted from his vehicle in Orlu, a town in the state on Friday morning. 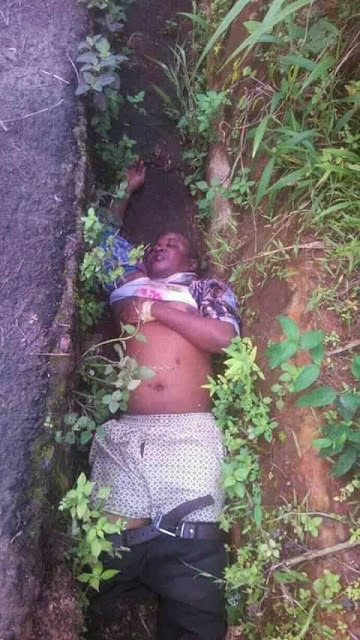 Following a manhunt, a body was discovered in the bush in Omuma village in Orlu east local government area, still in Imo, on Saturday. The commissioner said the corpse had been identified as that of the priest. He also said investigations were ongoing to unveil Onunkwo’s killers. There are speculations that he may have been strangled as his body had no gunshot nor stab wounds, according to the police. They also said his car was discovered intact, with nothing removed from it. The police said they have not made any arrest in connection with the incident.